(Bridgeport, Conn., June 27, 2017) – Bridgeport Bluefish team officials have announced the signing of right handed pitcher Elvin Ramirez, who participated in the team’s post-draft open player tryout on Monday, June 19, 2017. 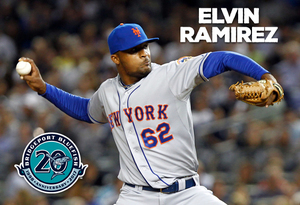 Elvin Ramirez joins the Bluefish during his 10th season of professional baseball and first in the Atlantic League. The former Major Leaguer last pitched in 2015 for Monterrey of the Mexican League. Before that, he was a member of the Cincinnati Reds organization, splitting the 2014 season between Triple-A Louisville of the International League and Double-A Pensacola of the Southern League. The 29-year-old made his professional debut in 2007 after being signed by the New York Mets organization as an undrafted free agent. He worked his way up the farm system and made his MLB debut on June 3, 2012. He pitched 21.1 innings across 20 games with the Mets, striking out 22 batters along the way. In 233 career minor league games, Ramirez has earned 20 victories with a 4.17 ERA and struck out 391 batters across 468.1 innings of work. In a corresponding roster move, the Bluefish have released RHP Danny Burawa.